Providing foraging opportunities for our primates does not have to be expensive or labor intensive. Below are a few simple things that you can make yourself that will provide hours of fun foraging activity for your monkey. You probably already have the materials needed for these activities. Fill empty toilet paper rolls with food and tape the ends closed with several layers of paper masking tape. 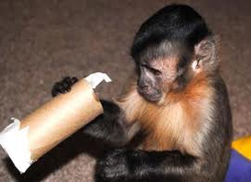 Adding paper shred makes it even more challenging to find the goodies once the tube is opened. Put chopped veggies or other food items in a brown paper lunch sack and tape it closed. Once your monkey learns this game, you can hide the sack and ask him to go and find his sack lunch and the search will be on. Some foods come sealed in their own natural containers and are lots of fun for monkeys to open. Try hard-boiled eggs in the shells, raw peanuts or other nuts in the in the shells, corn on the cob in the husks and green peas in the pods. The small, bathroom-size Dixie cups are the perfect size for little hands. Try filling with applesauce or diluted fruit juice and freezing. Almost any food can be coated with natural peanut, almond butter or coconut oil and rolled in a foraging mix containing healthy ingredients. Scatter handfuls of seeds, nuts, or foraging mix over clean carpeting and watch the monkeys pick, pick, pick away. When the fun is over, just vacuum up the mess. This is especially fun on hot summer days. Place a piece of fruit or vegetable in each section of an ice cube tray, fill with water and freeze. 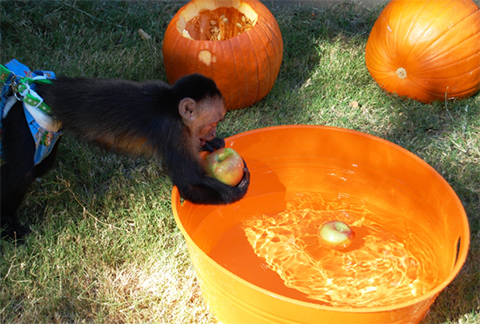 Toss a few out to keep your monkey friends cool while they lick their way to their food. This can be done with other containers to make different ice objects. A Jell-O mold made a nice frozen ring that kept our monkeys cool and wet all day while they waited for their orange slices to reach the surface of the melting ice. Fill a pail with paper shred, wood shavings, or straw. Bury a few treats or food items in the shred. 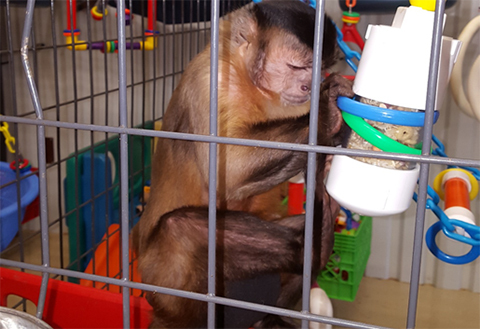 Attach the bucket to the side of the cage so that it cannot be dumped, and watch your monkey empty the bucket looking for the treats. This activity can be made more challenging by putting a lid on the bucket with a hole cut in it. This is especially fun with insects or mealworms. Spread nut butter over an unused paint roller and roll in monkey chow crumbs, seeds, or foraging mix then let it dry. A chain can be threaded through the roller for hanging in the cage. 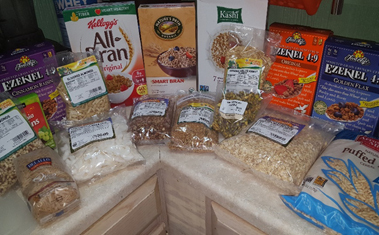 Almost any container can be filled with food items and sealed shut with masking tape. 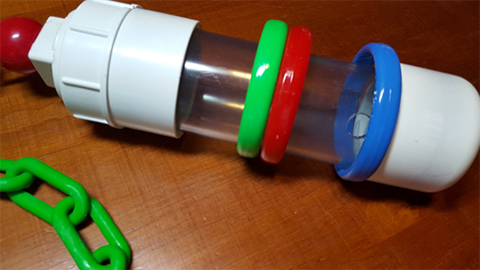 See how long it takes your monkey to break through the seal and get to their treats. Adding paper shred adds to the fun. Try this with 2-liter soda bottles, water bottles, infant formula cans, empty baby wipe boxes, butter tubs, oatmeal cans and gallon milk jugs. A sandbox is a wonderful enrichment element in an outdoor enclosure. It can double as a foraging device when food items are buried in the sand. This works well with peanuts in the shell or hard-boiled eggs. A large tub or child’s wading pool filled with water is lots of fun on a summer day. Toss in a few food items for some foraging and food-fishing. Try using a few items that float, such as apple slices or raw spinach leaves, and a few items that sink to the bottom such as grapes or berries to make the activity last longer. There are many foraging toys and devices that can be purchased today. Only a few items will be mentioned here. Websites are listed below with additional resources for purchasing foraging devices, feeders and puzzle feeders. 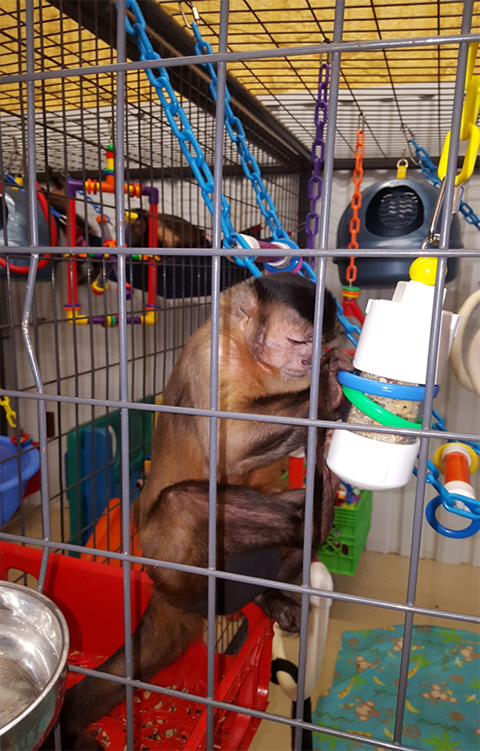 Many of these items can be purchased at pet stores or feed stores, but some must be ordered from companies that specialize in providing enrichment equipment to laboratories and zoos, and others can be ordered from vendors within the monkey community that make and sell them. These are homemade devices made out of PVC pipe. The styles vary in size and shape, but they are all designed to hold food that is accessed by the primate through holes in the pipe. Variations in the size and spacing of the holes dictate how challenging the puzzle is. These items can often be purchased at picnics and gatherings, as a number of individuals within the monkey community make and sell them. You can contact them by inquiring on social media. Many items designed to enhance the feeding experience for dogs make excellent foragers for primates. These can be found in pet stores such as PetsMart, and online stores that sell pet supplies. These items come in a nearly endless array of sizes and shapes. 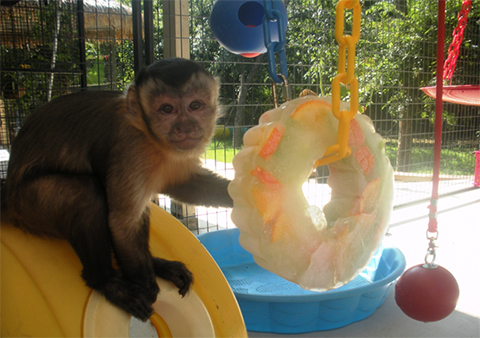 Some favorites of monkey owners are the Tug-a-Jug, Buster Food Cube, Kongs, and Treatsie Roll. Parrots enjoy and benefit from foraging activities much like primates do. There are several high-quality foraging devices designed for parrots and made from hard acrylic material. As with the dog products, these items can be purchased at pet stores and online pet supply dealers. Some favorites that are enjoyed by primates are the Rings of Fortune, Can-O-Nuts, Turn and Learn Log, and the Foraging Wheel. 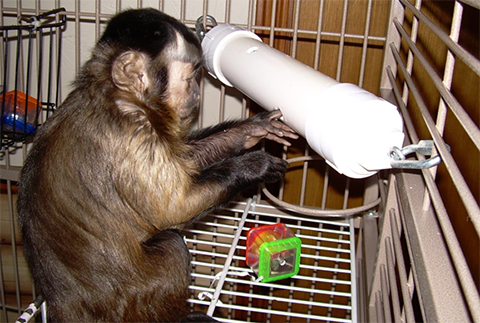 There are a number of companies that specialize in making and/or selling high-quality enrichment devices for primates in laboratory and zoo settings. These items tend to be durable and well designed. They also tend to be expensive, but because of their durability can be considered an investment in your primate’s happiness and well-being. 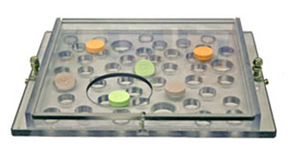 Some companies, such as Bio-Serv, make specially designed treat products that fit in the foraging devices they sell. Beware though, as some of these treats are high in sugar. 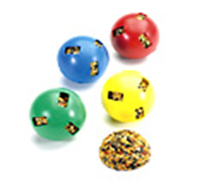 Some of the products that are frequently used by caregivers in the private sector are the Super Challenger Ball, Finger Board and Shake-A-Treat by Bio-Serv, and the NutraToss puzzle feeder by Primate Products, Inc.
NutraToss by Primate Products, Inc.
More important than the foraging device is the food that is placed in the device. Foods for enrichment should be selected with the same care as the primary diet and should be calculated as part of the primary diet. Sweets should be used sparingly and always accompanied by a complex carb or protein to bring down the glycemic load. 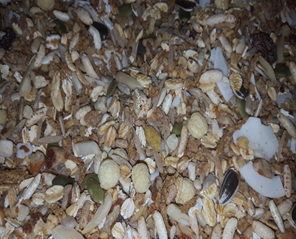 Combining some of the following foods into a foraging mix creates an interesting blend of textures and colors that will hold primates’ interest longer than a single food item. Including just a few special treats such as dried fruit or raisins creates an element of surprise that will encourage continued foraging as the monkey hopes to find another especially yummy morsel.